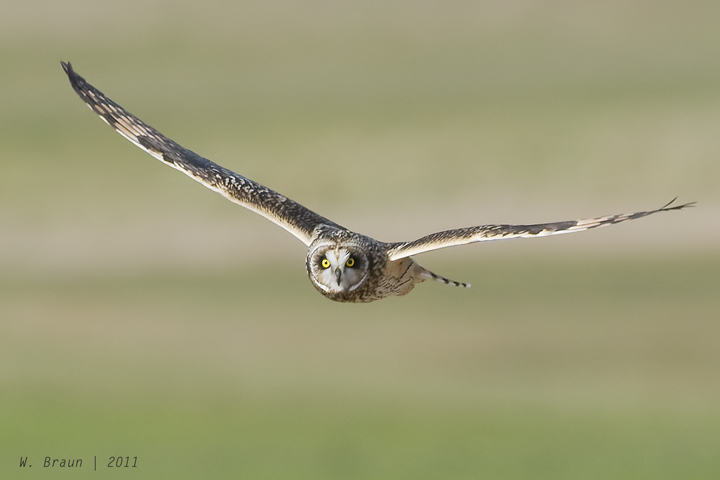 The Short-eared Owl (Asio flammeus) is a world traveler! It can be spotted in every continent except Australia and Antarctica. 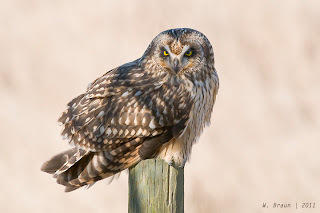 Indeed, it is one of the most widely distributed owls on the planet. 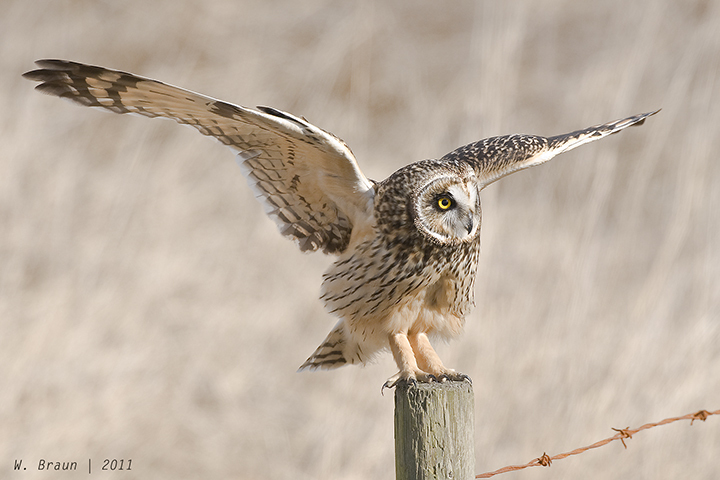 It breeds in every province and territory in Canada. 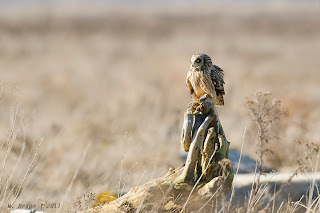 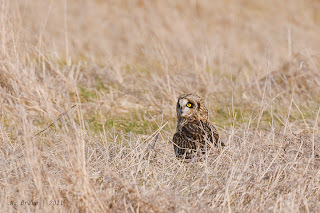 A medium-sized owl, about the size of a crow, this species likes vast stretches of fairly open habitat, particularly marshland and deep grass fields. Prairies, grassy plains and tundra are some of its preferred summer haunts. 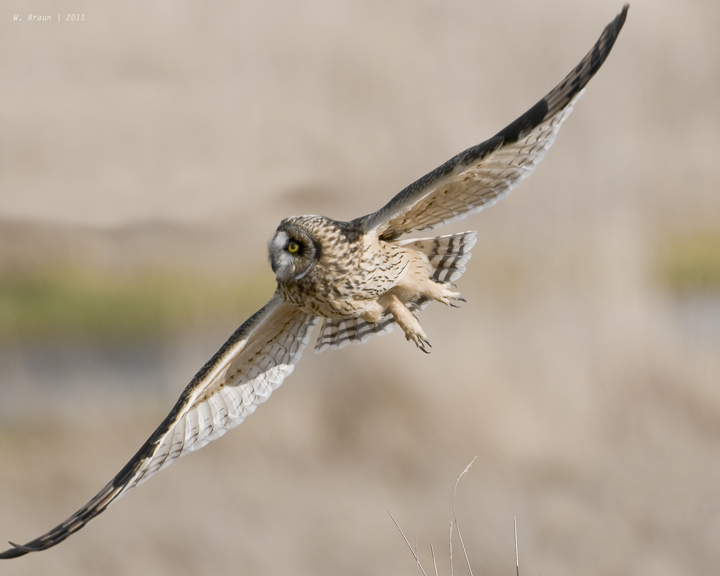 Large-scale destruction of native prairie grasslands, wetland drainage, urban expansion and increasingly intensive agricultural practices are contributing to the decline of the Short-eared Owl. 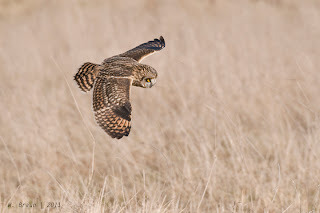 It is on the “blue list” (species at risk) in Alberta and British Columbia. 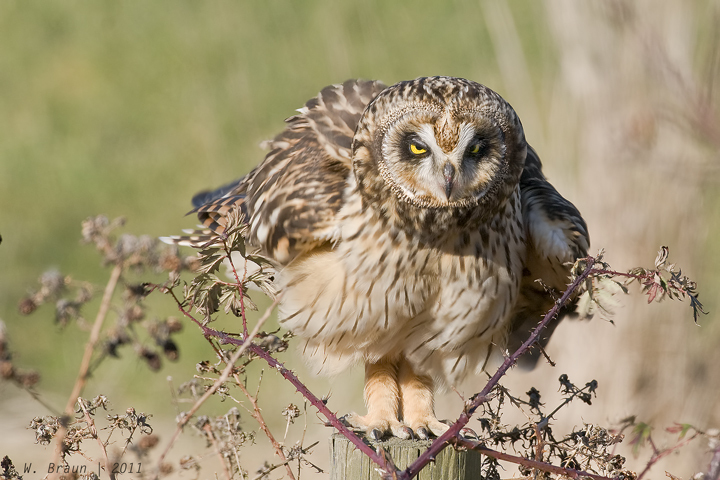 I spent a most delightful few hours with this female “shortie” in Boundary Bay in south Delta, BC. Much of the bay is surrounded by marshland and grass fields and it’s proximate to the Fraser River delta, which is Shortie’s prime wintering area in BC. The scientific name is from the Latin words asio, used by Pliny to specify a horned owl, and flammeus, meaning flaming or fiery and refers to the appearance of the bird’s plumage. The common name indicates the short feather tufts on its head that are difficult to see except when the owl is excited. 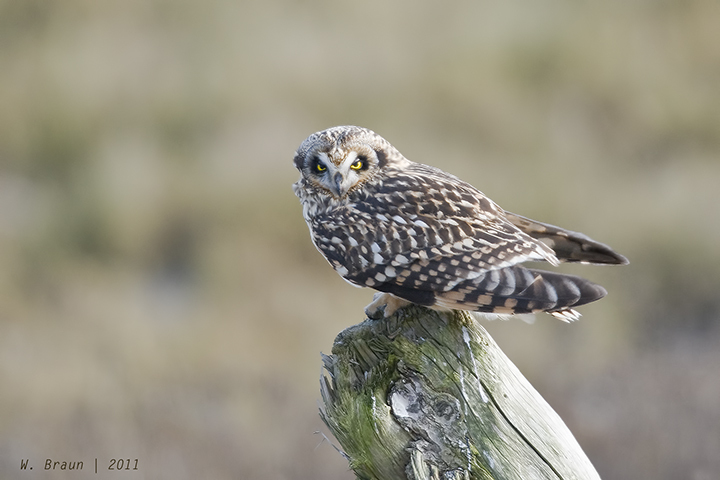 This bird has also been called a Bog Owl, Flat-faced Owl, Grass Owl, and Marsh Owl. 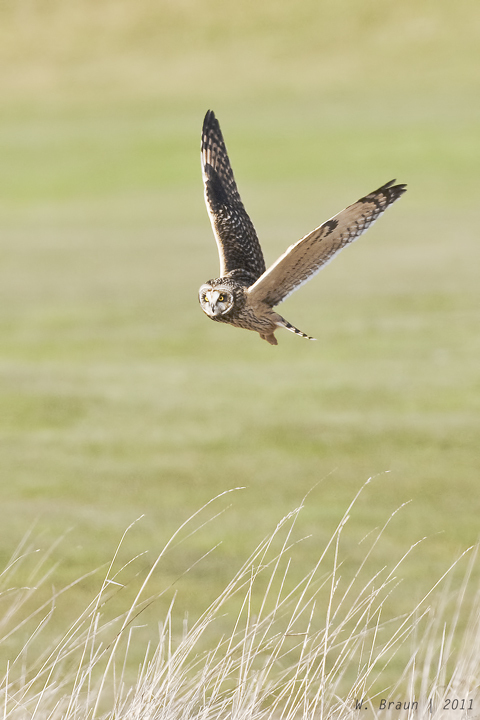 Short-eared Owls actively hunt during the day (diurnal), at night (nocturnal), and at dusk and dawn (crepuscular). 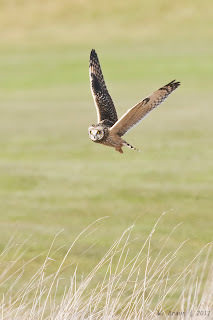 By using a low slow flight over the ground, they hunt small mammals such as voles (by far its preferred diet), moles and occasionally other birds. The owls fly close to the ground and are noted for their erratic, bounding, hovering flight reminiscent of a butterfly. 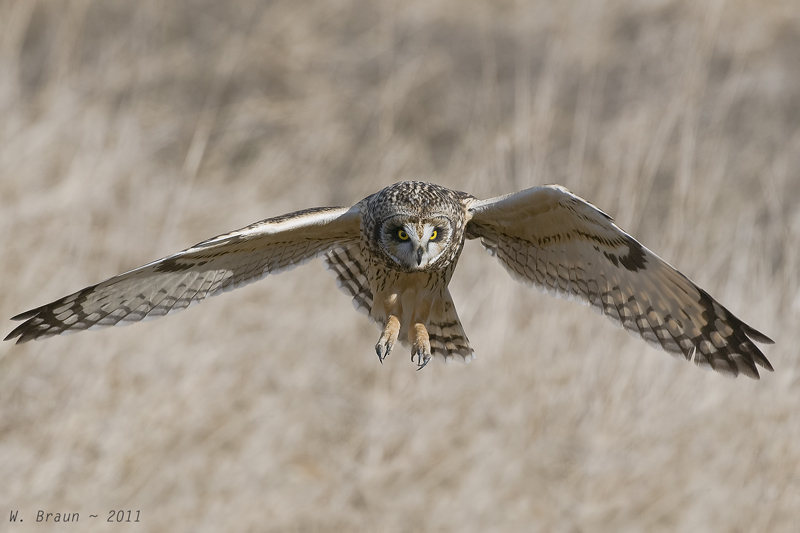 A hovering bird that sees prey dives toward the ground and carries its catch away in its talons. 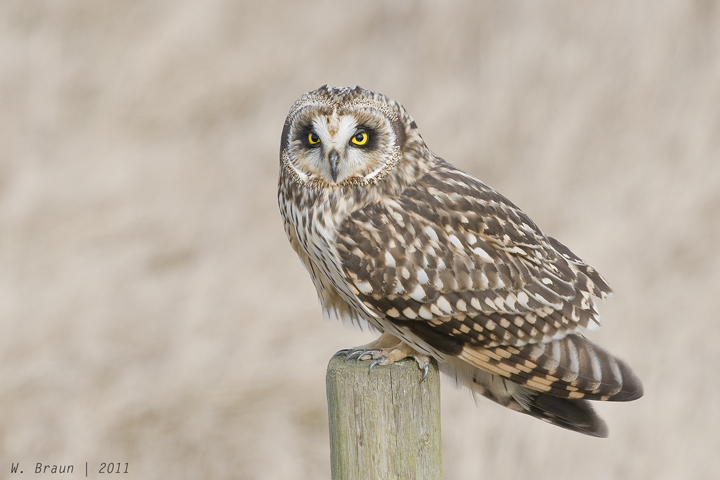 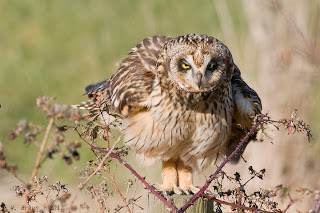 Short-eared owls often hunt while standing on the ground as well, or perching on a fence post in a characteristically horizontal position (unlike other owls that sit very upright). 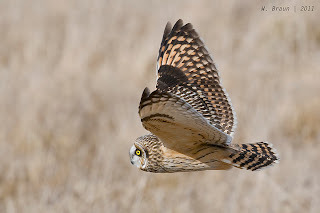 The Shortie in these photographs is a female. 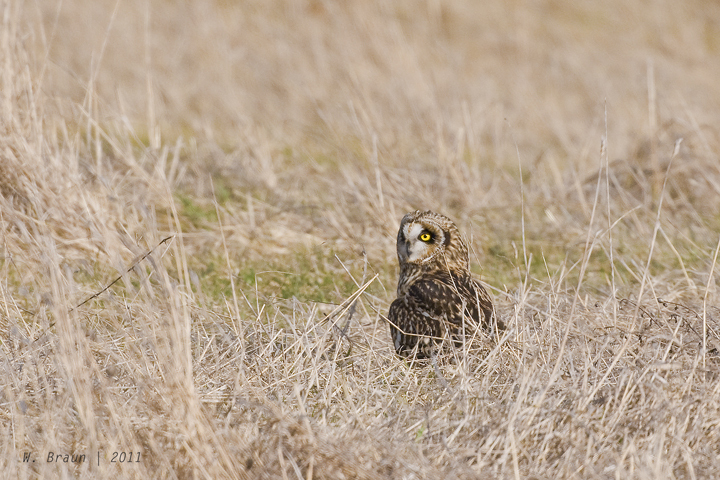 The male is a bit smaller and paler on the chest, with less streaking, and paler in its facial disk.